The best way to go view the latest adaption of True Grit is as its own entity. There was the first movie with the legendary John Wayne and now there is the 21st century version with Jeff Bridges. Both versions are good representations of the book by Charles Portis. Though neither can deliver the true sense of revenge that the book delivers, but what movie can when adapted from a book? For the sake of the new viewer let us focus sole on this version rather than make comparisons to the original. The film is about young Mattie Ross (Hailee Steinfeld) whose father is murdered by his hired hand, Tom Chaney, played by Josh Brolin. She sets out to seek revenge on Chaney and finds the toughest U.S Marshal out there, Reuben J "Rooster" Cogburn, played by Jeff Bridges. Bridges does an excellent job bringing out Cogburn's more base qualities, i.e. his excessive drinking, overall sloth, and general ugly personality. Perhaps his portrayal of "Bad" Blake in Crazy Heart helped him with this role, but there is certainly no sense of redemption for the character this time around. Along the way Mattie and Rooster bump into Texas Ranger LaBoeuf, played by Matt Damon, who is also pursuing Chaney but for different reasons. Naturally everyone will be discussing the fact that Jeff Bridges is taking on the role that won John Wayne his only Oscar and it is quite possible that Bridges will be nominated as well given the level of gravitas he brings to the role. But what most audiences will find surprising is young Hailee Steinfeld in the role of Mattie Ross. It's her take on Mattie Ross as well as the Coen brother's decision to focus the movie more on her that will catch viewers off guard. Her performance of a girl struggling not only with the loss of her father but also with the two men attempting to assist her speaks volumes; there is no doubt we will see more her in the future. The other thing worth mentioning is Joel and Ethan Coen's vision of the old west. Over the years there have been countless adaptations of the old west told on screen. After a while one could begin to wonder if perhaps that particular well had run dry. But what the Coen's did was bring their own unique voice and visual style to the movie. They have made their most sincere film yet, bringing to screen a western as spare and yet as majestic as its landscapes. The Coen's continually prove that they will not be type cast as any kind of style of director and this movie, once again, proves that. Overall, True Grit has all the joys that we have come to expect from westerns; harsh landscapes that yield incredible beauty, tough as nails characters who won't quit, excellent shoot outs, and fantastic storytelling. To say that True Grit is the best western to ever to come to the screen is a bit of a stretch, but it is most definitely the most honest. 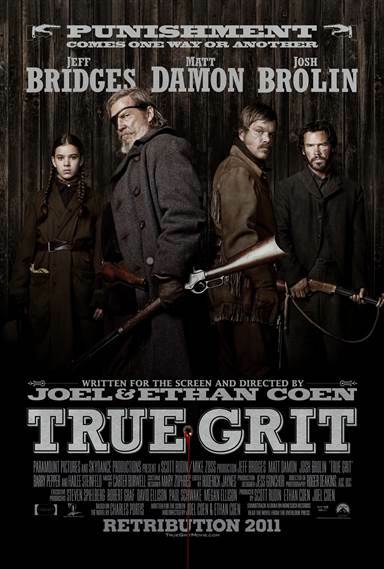 Download True Grit from the iTunes Store in Digial HD. For more information about True Grit visit the FlickDirect Movie Database.